Diagram of the new stadium. One of the big disappointments of last year’s football season was the Minnesota Vikings having to go into the playoffs without Christian Ponder. It was as though the wild card game against the Green Bay Packers was tantamount to a little league forfeit. Joe Webb couldn’t complete a pass and all the while left many NFL fans, especially Viking fans lamenting: What would have happened had Ponder played?? After all, this was a team that had won 5 of their last 7 including 4 in a row to make the playoffs. They had just outlasted those same Packers 37-34 in the finale, and we’d never know what momentum and tactical advantages they would have taken into the wild card game. Then to turn around and watch with abject horror as Colin Kaepernick destroyed the Packers defense in the divisional playoff. 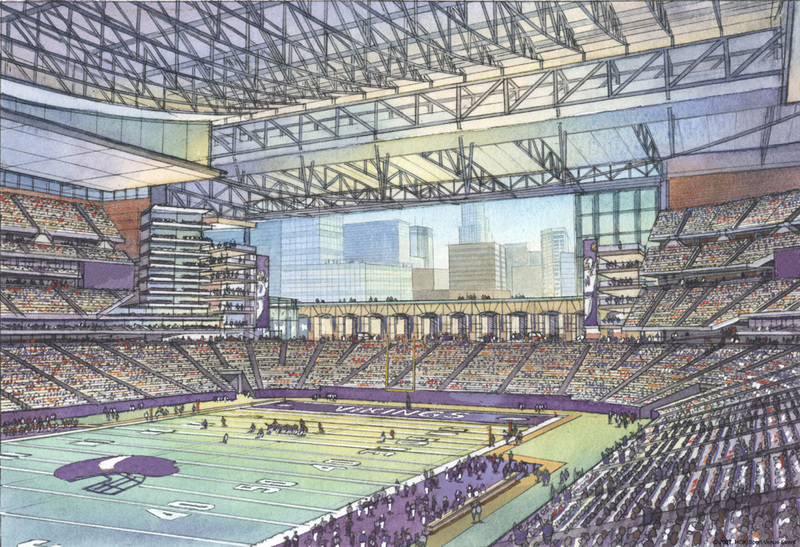 How could Vikings fans not feel empty?? Especially when the Vikings had beat down the 49ers 24-13 during the regular season. Yet Christian Ponder made it to a golf tournament the next week?? Much like the situation with Jay Cutler in the 2010 NFC Championship, many felt he should have given an effort. To think that had the Vikings been able to make it past the Packers & 49ers, they would have had 2,000 yard rusher Adrian Peterson face the 24th ranked defense of the Atlanta Falcons in the NFC Championship. 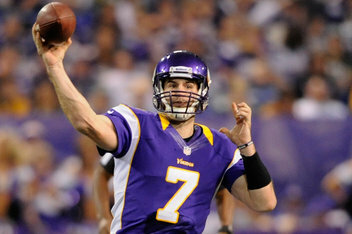 Jared Allen stepped up the pressure when he stated Ponder needs to be “the guy” for the Vikings to make the next move. Fans and others within the organization will follow that thinking. Quarterback: Coming into the 2013 season, few quarterbacks have more pressure on them to show improvement than Christian Ponder. Some of it has to do with the antics surrounding his questionable absence in last year’s wild card loss. However the other reason is the Vikings trading away a Percy Harvin and signing a polished receiver in Greg Jennings, formerly of the Packers. With the emergence of Pro Bowl MVP in Tight End Kyle Rudolph, he now has weapons to take pressure off of the running game. Sounds like a lot to ask from a player starting just his second season, but the bar has been raised with the stellar play of fellow NFC first year starters in Colin Kaepernick, Russell Wilson, and Robert Griffin III. Ponder didn’t have a bad season as he completed 300 of 483 passes (62.1%) for 2,935 yards, 18 touchdowns & 12 interceptions. 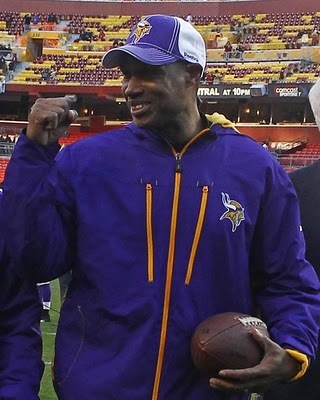 Yet without the fan fare, he led his team to a 10-6 record but a truer perception was Peterson carried the team. One aspect of his game is his mobility. He has quick feet which helps him on waggles, play action roll-outs, and when he needs to evade the rush. Last year he escaped the pocket 60 times for 263 yards and 2 touchdowns. In all actuality he grew from the late game mistakes on the road early last season and finished winning the last two to propel the Vikings into the playoffs. If he hadn’t thrown the late game interception against Washington last year, or been efficient in the 4th quarter against the Colts, this team could have been 12-4 and a first round bye. With improved weapons he may graduate to a playoff caliber team. We’ll wait ’til summer to anoint that. Right now the Vikings are average at quarterback. 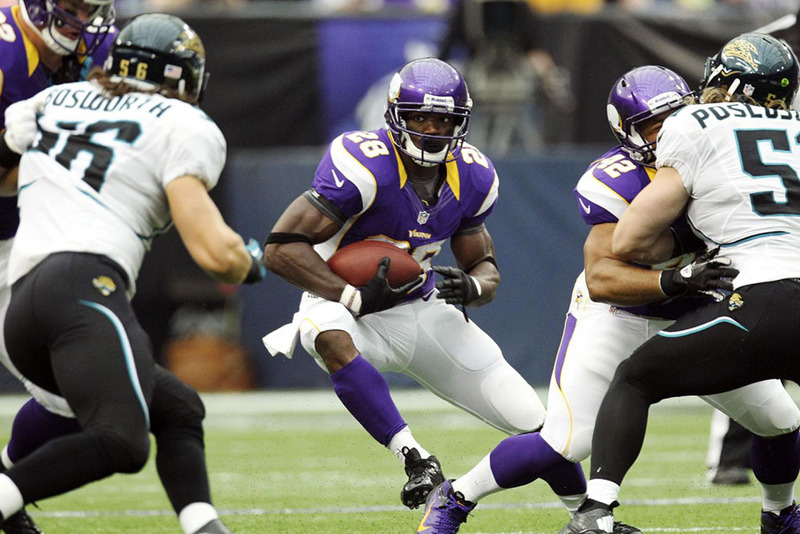 It’s time to compare Adrian Peterson with the all time greats and not just his contemporaries. Offensive Backfield: Adrian Peterson…enough said. This is a Hall of Fame running back in his prime. Has there ever been a better season than his 2,097 yard 12 touchdown performance in 2012?? He averaged 6 yards per carry when defenses knew he was coming. That is obscene!! He broke breathtakingly long runs week after week as he showed a miraculous recovery from his devastating knee injury suffered in 2011. Out of the backfield he caught 40 passes for 217 yards and another touchdown. Amazingly he isn’t even 28 yet and could possibly become the first runner in history to have a second 2,000 yard season. Already the record holder of the single season rushing record with a 296 yard performance, Eric Dickerson’s 2,105 is definitely in his sights. Toby Gerhart (50 car./169 yds /1 TD) spells Peterson for short yardage and is used as a blocker. No question are the Vikings Super Bowl caliber at the position. 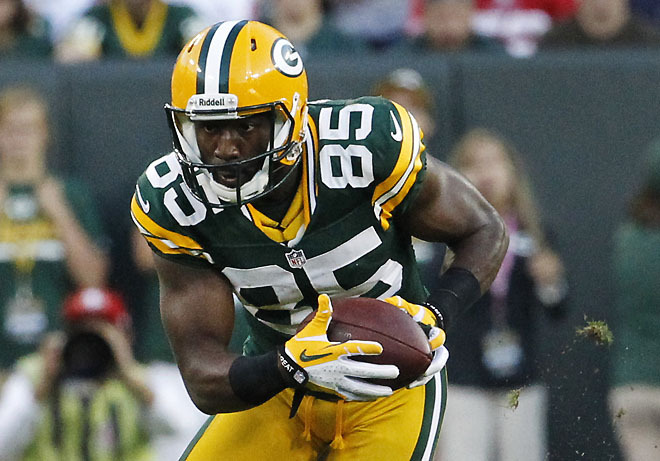 Jennings move to the Vikings should spice the already heated rivalry with the Packers. Receivers: Let’s be honest Viking fans, when Percy Harvin was traded to Seattle: How many of you saw the Vikings pulling a coup and signing Greg Jennings from Green Bay?? Now to keep teams from doubling TE Kyle Rudolph, here comes arguably the most complete receiver in the NFC North over the last five years…well sort of. Before his injury plagued 2012, Jennings averaged 68.8 receptions for 1,107 yards and 9.2 touchdowns per season between 2007-2011. He is versatile enough to play either the X or Z receiver. Jennings is a crafty, quick receiver that excels in getting up the seems. Turning 30, he has at least 4 more years at his present production level. To further the point of surrounding Ponder with the best available weapons, the Vikings spent a 1st round pick on Cordarrelle Patterson out of Tennessee. Where he’ll pay immediate special teams dividends, Minnesota signed 5 other receivers to make sure Jennings has the right bookend when the season commences. However the number one beneficiary from the departure of Harvin will be pro bowl tight end Kyle Rudolph. His production will rise above the 53 catches (493 yds/ 9TDs) now the Vikings aren’t forcing underneath passes to Harvin. Look for a 90 catch season as they’re just scratching the surface with the 24 year old tight end out of Notre Dame. Along with Jennings and the stability of the running game with Adrian Peterson, this is a playoff caliber receiving corps. If Patterson develops, he can take the top off of the defense and this rating will go up. They did give him Randy Moss’ old jersey number too. Offensive Line: After re-signing RT Phil Loadholt, the Vikings are bringing back an offensive line that had all five members play all 16 games in 2012. Although Peterson ran for more than 2,000 yards, how much was due to the line?? Did you know that last year in obvious power running situations (3rd/4th and 2 or less), the Vikings were 18th converting to the strong side (60%) and dead last or 32nd (36%) converting up the middle?? Did you know the Vikings were dead last in the NFL with negative rushing plays up the middle with 27?? Did you know they were also 7th in negative rushing plays to the strong side with 18?? Some improvement is needed here. Keep in mind the Vikings drafted two Guards in later rounds, yet the incumbent Center and Guards, John Sullivan, Charlie Johnson,and Brandon Fusco may have some competition. All three were 6th round selections themselves. So there will be competition on the offensive line. Last year they ranked 11th in sacks allowed with 30 and 5th in hits on the quarterback with 64. However their inability to get push in obvious situations drops their rank to average. Many of Peterson’s best runs were bounce outs and second effort plays. Jared Allen has been a force in the NFC North for several years. 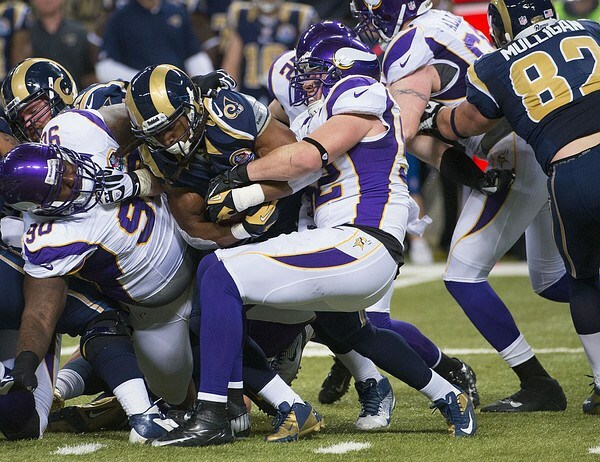 Defensive Line: Where have you gone Jared Allen?? Actually he hasn’t gone anywhere yet, but he is about to enter the last year of his contract. One year removed from a 22 sack season, he followed that up with a 46 tackle, 12 sack performance. He was the focal point of every opponents blocking scheme, so a dip in production is understandable. Allen shows up in games at home as well as on the road. Case and point, when he beat Houston Texans’ All Pro and Pro Bowl Tackle Duane Brown for 2 sacks and incurred 2 penalties in a week 16 upset over the Texans on the road. Now he’s going to play for a new contract?? Watch out!! With Allen as the focal point of the line, the Vikings can implement their first #1 draft pick in DT Shariff Floyd, without the pressure to “be the man” right away. This guy is a freakish athlete that can either learn at defensive tackle from 11 year vet Kevin Willams (31 tackles /2 sacks), or rotate with DT Letroy Guion (31 tackles / 2 sacks). Imagine this 6’3 315 lbs. rookie known for his strength and quickness joining pass rushing DT Everson Griffen (8 sacks), DE Brian Robison (37 tackles / 8.5 sacks) along with Allen’s totals. Although Robison and Allen are 30 and 31 respectively, Robison and Griffen are only 25 so they have a perfect blend of youth and experience. Keep in mind this group had 44 sacks last year. This number will go up this year. This is the re-birth of the Purple People Eaters and a Super Bowl caliber group. Chad Greenway is the best linebacker in the NFC North and one of the best in the NFL. Linebackers: Although Brian Urlacher retired from football, the best linebacker in the NFC North has been Chad Greenway for quite some time. He is the equal to both Navorro Bowman and Patrick Willis in San Francisco. He’s actually a better linebacker than Willis and tracks down ball carriers and receivers from sideline to sideline. How can we say that?? Did you know over the last 3 years Greenway has averaged 147 tackles per year?? His 442 tackles dwarf Willis 353 in that exact same time frame. The only knock on Greenway is he doesn’t force as many turnovers as the celebrated San Francisco duo. He recovered 2 fumbles during his 146 tackle, 3 sack, 1 interception 2012 campaign. He is beginning to get the recognition he deserves nationally. 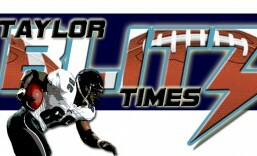 However here at Taylor Blitz Times he’s been lauded as one of the premiere linebackers in football. The other two linebackers are Jasper Brinkley ( 87 tackles / 3 forced fumbles) and Erin Henderson (79 tackles / 3 sacks / 1 forced fumble) are solid but may see some competition this summer. When management steps out and drafts two players at your position. They’re looking to push you and add to special teams quality. Fourth round selection Gerald Hodges and seventh rounder Michael Mauti are both from Penn St. This is an average group that may be playoff worthy behind a dominant rush. White men can’t jump huh?? Think again. Harrison Smith is a true talent at Free Safety. He should make the Pro Bowl in his second season easily. Secondary: The Vikings are hoping to strike gold, like they did with the success of FS Harrison Smith in the drafting of 1st round CB Xavier Rhodes. Last year Smith showed range and had a good rookie season with 97 tackles, 11 passes defensed, along with 3 interceptions and two of those returned for touchdowns. In another year, those are Pro Bowl numbers. He should grab about 8 interceptions in 2013. At 6’2, 213 lbs, he has the range of the safeties from the golden era of the 1980s. Very angular with long arms, he is hard to throw over. For comparisons sake, future Hall of Famer Ed Reed had 85 tackles, 5 interceptions, and 12 passes defensed in his rookie years. Look out this might be the best Viking FS since Paul Krause. Drafting Rhodes in the first round means they will plug him into the lineup right away. Don’t forget Head Coach Leslie Frazier is a defensive back coach at heart. Rhodes acquisition spelled the end for long time Viking Antoine Winfield. In comes a 6’1 210 lbs corner that runs a 4.43 40. He’s physical in press coverage and he better decide to tackle against the run. Winfield was the second leading tackler on the team. If CB Josh Robinson ( 52 tackles / 2 interceptions) can improve, this is a playoff caliber group. Behind this pass rush they may be better than that by season’s end. Head Coach Leslie Frazier may not be too far from an NFC Championship appearance. If Ponder can show some improvement….. hmmm?? Overall: This team is the NFC version of the Kansas City Chiefs. No other team has put a team together where the quarterback just has to play adequately, and the playoffs are a reality. If Ponder can show the same improvement he did over the last two seasons, this team could crash the NFC Championship Game if Atlanta or Seattle stumbles. They fit the formula of the modern day league champion. Young quarterback without a team crippling contract, a young improving defense with two players who are front runners as Taylor Blitz Times Defensive Player of the Year candidates. Now they have a receiving corps to take pressure off of future Hall of fame running back Adrian Peterson. This team is equipped to win the NFC North and should do so with Ponder developing his quarterbacking skills. This year he has to read the defense instead of leaning on crossing routes to Percy Harvin. Throwing to Harvin was stunting his growth from a reading the defense and progression standpoint. They have given him a quality receiver while drafting another who can get deep. He should have some options. As Ponder goes….so goes the Viking season. This team is loaded with few holes. NEXT: 2013 Chicago Bears Preview.